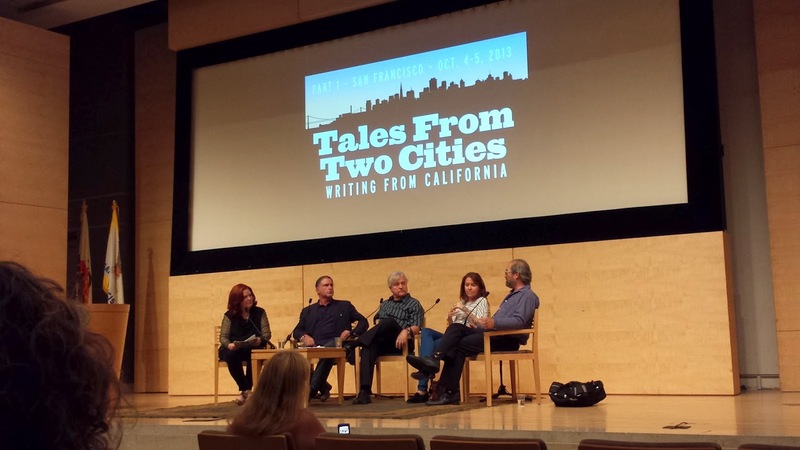 On Friday, the 4th and Saturday, the 5th of October the San Francisco Conference 'Tales from Two Cities - Writing from California' took place. The L.A. conference is planned for February 2014.It was a free conference examining the literature of Alta, California, north and south. Poetry, fiction, non-fiction, print and digital: all part of how California defines itself, going back to the earliest days. 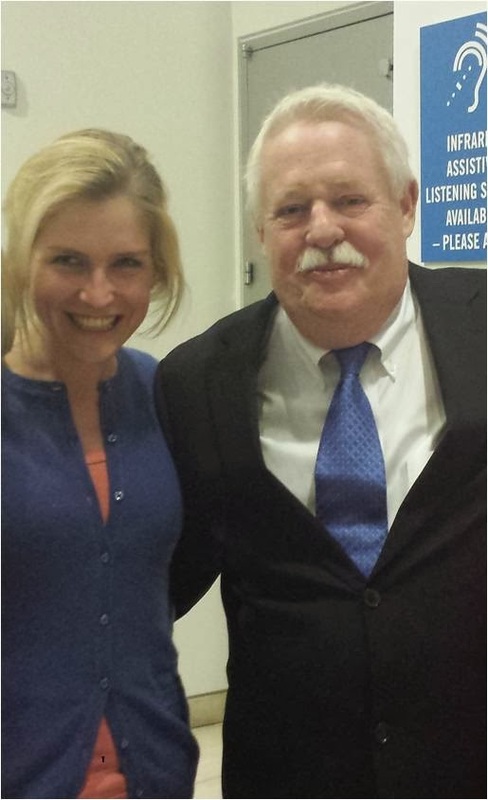 I attended some of the speeches in San Francisco and was very impressed by the interview between Armistead Maupin and David Ulin. And I finally even got to meet Armistead in person. As he is the inspiration for my "How to love San Francisco" book this was a very special day for me. 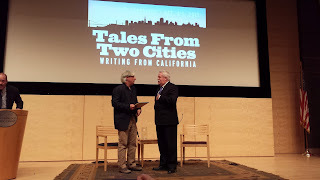 Armistead gave some insights about the art of writing 'Tales of the City' and making the Series, first published by a newspaper into a book series. He shared that he used a lot of 'real life input' as he was sitting next to the News Editor and thus was able to build in the latest news into his daily 'Tales of the City' column. Armistead is now working on another book which is planned for release beginning of next year. As you might know,my recent book - which is know available for free in a text + audio version - got inspired by Armistead Maupins' Tales of the City. On Saturday I listened to the talk "the City", which you can watch here. 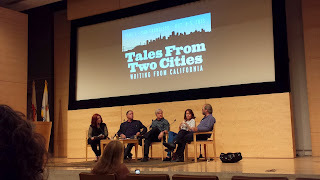 Moderated by Jane Ganahl, this panel tackled “the city.” Originally the panel was planed to answer questions such as: What's the enduring power of San Francisco as literary site, trope, problem, puzzle, mystery, icon? The City in fiction, The City in fact: where do they crossover, diverge, collide? Who are the great interpreters of The City then and now? But interestingly this panel was purely about how the literary scene of San Francisco has changed over the years - especially influenced by the tech scene. The panel with David Talbot, Phil Bronstein, Gary Kamiya and Michelle Tea described that there is a Manhattanization happening and San Francisco is becoming a 'Boutique City for rich people'. Unfortunately this is becoming more and more true. 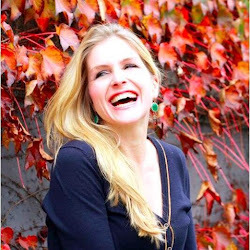 In addition author Michelle Tea claimed that there is no connection whatsoever between the tech and creative writing community. She asked how we could better connect and collaborate with the vivid tech scene and bring artists and entrepreneurs closer together. Michelle mentioned as well that Dave Eggers, the founder of a writing non-profit and author of several books recently mentioned that he can live pretty well along with all the tech people on hip Valencia Street. But have you read already about his latest book? The Tech-Satire The Circle picks up the challenges of the thriving tech industry in the Bay Area. The book is about 500-pages long and describes life under a totalitarian regime of a Google-meets Facebook-like tech giant. How can we save the literary scene of San Francisco? And how can tech and art move closer together? What are your ideas?